The Certified Medical Assistant (CMA) exam is administered by the American Association of Medical Assistants (AAMA) to determine credentialing for medical assistants. It is meant to test candidates on their knowledge of the medical assistant profession and to ensure that medical assistants meet rigorous and necessary standards of excellence in their field. Who Is Eligible for The CMA Exam? 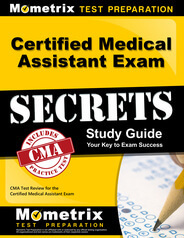 Prepare with our Certified Medical Assistant Study Guide and Practice Questions. Print or eBook. Guaranteed to raise your score. Get started today! There are three eligibility categories for taking the CMA exam, each with different criteria. How Can I Apply for The CMA Exam? Depending upon which eligibility category they satisfy, candidates will have to take slightly different approaches to applying for the CMA exam. For category one, candidates won’t need to provide any documentation, but their program directors will have to verify their program completion before official test scores or certification is provided. The nonrefundable exam fee is $125. For category two, candidates must provide an official transcript. The nonrefundable exam fee is $125 for AAMA members and $250 for non-members. For category three, candidates must provide their previous CMA certificate number and most recent certification/recertification date. The nonrefundable exam fee is $125 for AAMA members and $250 for non-members. Candidates should then determine a start date for their 90-day period in which to take the exam. Candidates can apply online or through the mail. Where and How Is the CMA Exam Administered? The CMA exam is given through the testing services provider Prometric at testing centers around the country. It is a computerized exam that includes 200 multiple-choice questions. The exam is administered in four sections of 40 minutes each. There is an optional 20-minute break between sections. A total of 160 minutes is given to answer all questions. The final score is based on the number of correct responses accrued throughout the entire exam. AAMA provides a computer-based testing tutorial so that candidates can become familiar with the technology before taking their exams. Immediately before the exam begins, candidates can opt-in to a 15-minute tutorial that shows them how to navigate the exam. What Content Is on The CMA Exam? How Should I Study for The CMA Exam? Because the CMA exam consists of multiple-choice questions focused on a broad range of industry knowledge, drilling with tailor-made study tools is highly recommended for securing a passing score. 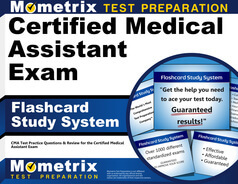 Mometrix offers both a proprietary study guide and a set of flashcards that are designed to provide success to those preparing to take the CMA exam.